Sue Beatrice's robot lets geeky loved ones know they light up your operating system (aka heart). Think robots are just heartless little computers? Think again. 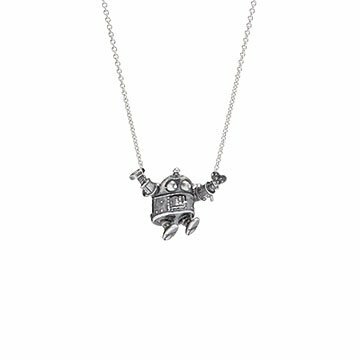 Sue Beatrice's bionic pendant is an ode to geek love. Her sterling silver figure even has an unofficial catchphrase: "Our combined data output is pure happiness." Send the adorable piece to your science- or math-brained sweetie to tell them their presence lights up your operating system (aka heart.) Handmade in Sea Cliff, New York. 1" L x .8" W; Chain: 18"
Wipe down with soft cloth.